When "the world rushed in" to California during the Gold Rush, the fastest travel route was by sea in the wooden clipper ships of the era. 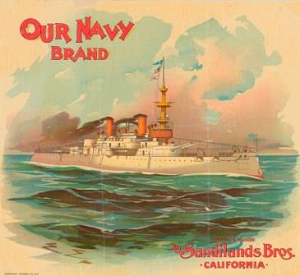 Products being imported into or exported from the state of California were also most likely transported by ship. These trademarks show the connection between 19th century merchandise and how it arrived at or was sent to market. As the century progressed, the ships reflected the switch over to steam power. Some trademarks featured wooden sailing vessels, steamships, and ships with a combination of steam power and sails—all familiar maritime images to the consumers of the time.